It’s been torture this week, reading all the posts from everybody enjoying Tales of the Cocktail. To salve the wounds, I’ve been doing research for this month’s Mixology Monday, hosted by Paul Clarke. For those of us that didn’t make the great NOLA party, he challanged: mix up a cocktail that either originated in or is inspired by New Orleans. I started with several favorite New Orleans classics, especially Sazeracs, Vieux Carrés, and Cocktails à la Louisiane. One thing I noticed is how much I’m enjoying that little something extra that the small dashes and rinses of absinthe bring to these drinks. I decided that it might be time to try a proper absinthe cocktail in the spirit of New Orleans. 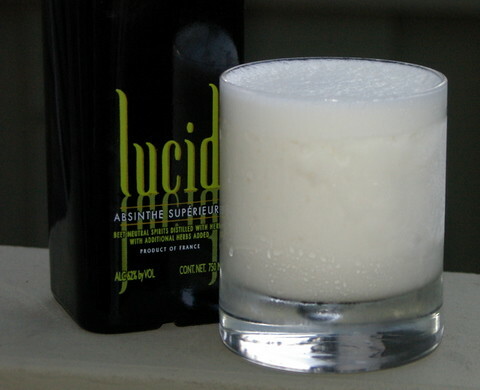 Naturally, Chuck Taggart came to the rescue in his first day summary, where he details the Absinthe Suissesse. At first read, it sounded almost like an absinthe version of a Ramos Gin Fizz, and I love the Ramos Gin Fizz, so I was eager to try. For my first round, I generally followed Chuck’s recipe, including the optional dash of orange flower water. But I shook the drink using cubed ice, not crushed, and strained it into an old fashioned glass. I gave an initial dry shake, as is my wont for drinks with egg whites, then shook for 15 seconds as suggested. Here the recipes for the Absinthe Suissesse to vary from the Ramos Gin Fizz, in that the goal doesn’t seem to be the meringue-style foam on top; the egg white is there mostly for body. This was a very enjoyable drink. I’d recommend it as a first absinthe cocktail for anyone who, like me, is still afraid of the green fairy. The cream and egg really soften the anise flavor, making it very mellow indeed. The orgeat plays nicely – it provides a nice dose of sweetness. I suspect it’s far more complimentary that straight simple syrup would be. I did find one recipe variation that used sugar instead, and decided that just wasn’t meant to be. In searching for recipes, and deciding whether to try the crème de menthe version that Chuck so strongly recommends against, I stumbled across a page of recipes from the Old Absinthe House, including their Absinthe Suissesse recipe. Their recipe is very similar, although it uses the whole egg, and milk instead of cream. For my next round, I decided I’d give the whole egg a try, and use the blender this time. I think the result is an excellent variation. The whole egg gives the drink a lot more roundness. It’s a more pronouncedly complex drink, with the absinthe coming in after the round smoothness of the dairy and egg to remind you, hey, I am a cocktail made with 124 proof liquor! Apparently this is recommended as a great morning hangover cure; I’ll let you know if I ever dare to try it as such. In the meantime, I’ll be waiting for the roundup by our host over at the The Cocktail Chronicles. My next interesting cocktail to make as soon as i get some Absinthe. My absolute favorite hangover cure when in New Orleans….Arnaud’s brunch with a few of these! Previous post: Knickerbocker Cocktail, or You never know how much tart 1/2 lime will get you!